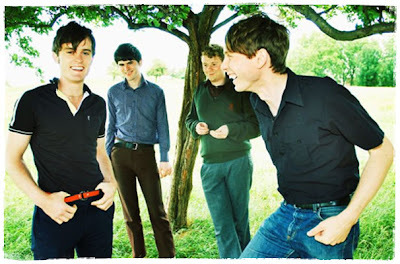 I know some of you are cringing your faces saying to yourselves, ‘Franz Ferdinand’s ‘Hallam Foe Dandelion Blow’ in this week’s ‘Covers, B-Sides and Rarities’?? Now, how does that work?’ It is in fact, as all most of you are aware neither a cover nor a b-side nor a rarity. But, I’d just like to include it here considering the facts that it is quite rare for Franz Ferdinand to come out with something slower paced and mellower such as ‘Hallam Foe Dandelion Blow’ plus you’ll never be able to find it anywhere else except for the CD soundtrack of the related film. The song was made for upcoming Scottish film ‘Hallam Foe’ starring the likes of Jamie Bell as you may or may not have recognized from that movie, ‘Billy Elliot’. I’m not quite familiar with the other lesser-known tunes of Franz Ferdinand; only the more prominent ones such as ‘you know what’ and ‘you know what’. But a tune like this makes no exception of why Franz Ferdinand is a great band in its own right.